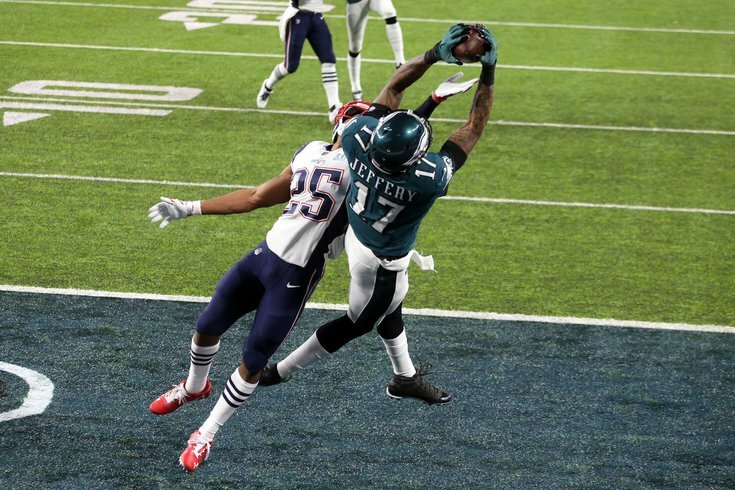 It might have been one of the best endings he ever could've asked for, but let's not forget that wide receiver Alshon Jeffery's first season in Philadelphia didn't get off the greatest of starts. And now we might have an idea as to why. MORE ON THE EAGLES: Recap: Eagles chat with Jimmy Kempski | Analysis of all 29 of Doug Pederson's 4th down 'go for it' calls in 2017 | Report: Eagles promote Mike Groh to offensive coordinator | What they're saying: How much will free agency, offseason trades impact Eagles offense? According to Ian Rapoport of the NFL Network, Jeffery underwent surgery on Wednesday to repair a torn rotator cuff, an injury he suffered way back in training camp. #Eagles WR Alshon Jeffery had successful surgery this morning on a torn rotator cuff, sources say. He suffered it in training camp and played through it, somehow, on the way to a Super Bowl. Playing on a one-year deal, Jeffery opted to play through the pain and was ultimately rewarded with a four-year, $52 million extension in December, a Super Bowl title in February, and the love of Eagles fans for the rest of time. But looking back on the season, it wasn't always sunny for Jeffery. Through his first seven games with the Eagles, Jeffery was averaging just 51 yards per game and had found the end zone only twice. Over his next seven games, however, Jeffery's production returned to the kind of numbers fans were expecting when Howie Roseman signed the veteran wideout last offseason. The former Bears wideout posted seven touchdowns and scored a pair of two-point conversions before basically sitting out the final two regular season games and finishing with with 57 catches for 789 and nine touchdowns. Then, in the postseason, Jeffery caught 12 more passes and scored three touchdowns (while averaging over 18 yards per reception), including his incredible 34-yard touchdown in the Super Bowl. Sure, the injury was there the whole time, but just looking at the numbers and thinking back to some of his uncharacteristic drops early in the season, one can't help but wonder whether or not the shoulder injury played a part in Jeffery's slow start to 2017. Either way, the 28-year-old not only figured out a way to play through the pain, but played so well that no one on the outside even realized he was hurt in the first place.